Cuts out the need for large capital equipment expenditure: Flexible short, temporary or long term hire and lease options to meet tidal requirements and testing, repair and upgrade outages. The latest world-renowned Cochran steam boilers in a range of capacities covering a broad spectrum of outputs. Rapid: A full site installation and commissioning service is included in the hire costs. Trailer-mounted and Containerised solutions and long-term high-volume static options. Temporary boilerhouses installed where required for larger capacity applications. Complete Package of Equipment: All combustion equipment, hoses and ancillary equipment included within the package. Water softening treatment and chemical dosing packages available as both stand-alone rentals or part of a comprehensive heat and power package. In addition, the provision of pressure reducing sets, additional pipework, blowdown vessels, fuel tanks and chimney and/or flue sections where required. Cochran equipment hire services include Trailer Mounted Boilers, Containerised Boilers, Static Boilers and Training. Unmanned Options: Compliance with PM5 guidelines for unmanned operation. Remote Cochran monitoring solutions available. Cochran Synergy advanced boiler management system is also available. UK Product Support: Boiler operating personnel available. Alternatively, on-site operator training can be provided by Cochran’s respected Training Team. Full back-up support from Cochran’s national UK service team, including 24/7 support. Cochran’s comprehensive spares stockholding ensures rapid problem solving. When your boiler plant is unavailable Cochran can supply steam and hot water for the duration of the outage. These outages are typically to allow emergency repair (often following insurance surveys, planned maintenance, or upgrades). When seasonal loads are present in a process, it may be more cost effective to use temporary steam or hot water, than to invest in extra boiler capacity with its requirement for space and maintenance. If a company needs steam for a short period for product research and development, Cochran can provide the facilities, and if permanent capacity is needed, Cochran can provide complete turnkey solutions to install permanent solutions. While new boilers have been ordered there may be a gap in steam or hot water production as the old boilers are removed and the new installed. As well as the manufacture and installation of new plant, Cochran can provide the necessary cover during the interim period. If cash and capital expenditure is an issue, Cochran can provide long term hire boilers to meet your needs, installed either in your existing facilities or provided in a custom built boilerhouse to be located where required. The Cochran Steam Boiler Hire Range runs from 50 kg/hr to 32,000 kg/hr with options for running boilers in parallel, operating at pressures up to 25 barg. The Cochran How Water Boiler Hire Range runs from 73 kW to 22,000 kW with options for running boilers in parallel, operating at pressures up to 25 barg. 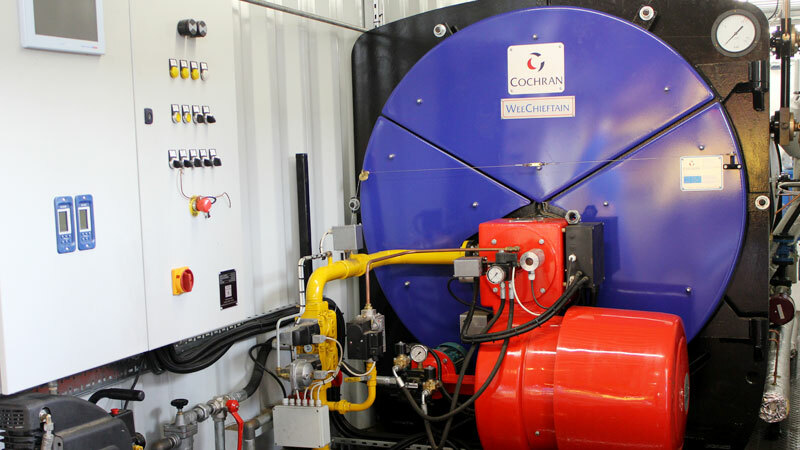 Cochran's hire boilers come in different packages including trailer mounted, containerised or complete with temporary boilerhouse for larger applications. Hire charges can be weekly or monthly, and will include delivery, installation and set-up. Operation and breakdown cover are optional. Customers only need supply water, fuel and electricity.